My Family Fun - Avengers Captain America Muscle Light Up Costume Attend the superhero party as the best hero this year! Attend the superhero party as the best hero this year! This costume includes a jumpsuit that resembles Captain America's classic costume that is blue with a white star on the chest. The sleeves are red and white as is the belt lining the waist. 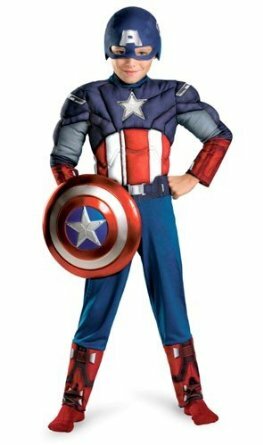 The chest and arms to this costume feature muscle padding that will make your son have the super strength of America's hero. The hood of the suit has a big white A on the forehead and two wings sticking out from the head. This mask hides your identity, something that Captain America fights hard for the right to do.